The Occupational Safety and Health Administration (OSHA) is a clear leader in the field of occupational safety but for years there has been criticism of OSHA noise exposure graphs and their overall suggestions regarding hearing loss in the workplace. While many OSHA training requirement standards for noise controls have been set there are some better resources. Here we'll take a look at some graphs and better yet cover some great information for hearing conservation in the workplace. You can see OSHA noise exposure graphs at the OSHA Web site. If you're an employer or employee worried about hearing loss at work and interested in hearing conservation there are better resources than cryptic graphs. Hearing conservation is important no matter which industry you work in. However, there are some particular groups that seem to be at the largest risk for hearing loss in the workplace. An article from Healthy Hearing sites the following at-risk groups. Research shows that individuals between the ages of 40-45 see an audiologist more often than any other age group for work-related hearing loss issues. Small and medium sized manufacturing plants. Often at small plants the individual in charge of safety is a foreman, supervisor or even the plant owner. This individual is unlikely to have proper training in hearing conservation and safety. Sadly manufacturing plants have much worse noise pollution than large companies who can afford to have a hearing specialist on the team. If you're interested in graphs that compare OSHA standards on workplace noise levels and noise exposure to other various agencies you can visit the Noise Pollution Clearinghouse (NPC). The NPC should be one of your first stops if you are looking for answers to workplace noise issues. Their database is extensive and well organized. Another excellent resource for occupational noise hazards is at The National Institute for Occupational Safety and Health. They publish an entire informative booklet on occupational noise exposure that's free to download. What is Noise? Noise is defined as "unwanted sound." Some of the many noises in a workplace are loud music, crowds, machines with moving parts, metal-on-metal contact, compressors, hoses and more. However, even if you like a noise or don't think you mind the sound, negative hearing health can still occur. You get headaches or feel dizzy from the noise. You are diagnosed with a hearing problem and co-workers also have the same issues. You have difficulty hearing conversations after work. Your ears ring after you leave your workplace. You or your co-workers need to speak louder than usual or yell to be heard at a normal distance for a conversation (arm's length). Maybe worst of all, if you can't hear in the workplace you can't stay safe. Imagine if you can't hear properly and someone is trying to get your attention as a pallet of boxes falls over or a vehicle is headed your way. Noise causes many more accidents each year that are in no way hearing related. Reducing noise levels (which seems like a no-brainer but many companies simply fail to set controls to the lowest levels available). Redesigning equipment to reduce the speed or impact of moving parts which includes applying mufflers, replacing old equipment, and maintaining equipment to keep it in good running order. Physically place equipment as far away from workers as possible. Cushion noise sources using rubber pads or enclosures. Rotate workers in and out of high noise areas. 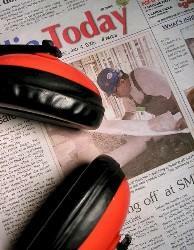 Make sure all workers have personal ear protective equipment and that they know how to use it. In addition employers should conduct continual monitoring of noise sources and the effect of the noise on employees. Job Safety Analysis (JSA) forms can be used to monitor noise issues. If you haven't seen a JSA before, read University Job Safety Analysis Manual to learn more. Whenever a change in equipment is made (such as new machines purchased) reassess noise levels. There's a lot of grousing about OSHA noise standards and how the OSHA noise exposure graphs aren't up to par. It's not wrong to expect proper regulations on safety. However, safety does not and should not exist simply because big brother is watching over your company. Employers can protect their own employees by becoming educated about hearing loss and conservation in the workplace. Employees can look into free workplace safety tips and noise resources to learn how to protect themselves from hazards. Hearing loss is an issue that affects everyone.